A lethal bacterial infection is affecting the planet Ariannus and the Enterprise has been sent to decontaminate it as it is a vital transfer point on the commercial space lanes. En route to the planet the Enterprise detects a shuttlecraft which had been reported stolen from Starbase 4 three weeks previously. The stolen craft is pursued and brought aboard the starship by tractor beam. On the hangar deck the shuttlecraft's door opens and a humanoid being emerges. The figure has an unusual skin coloration, being black on his left side and white on his right. He is taken to sickbay under guard where he identifies himself as being called Lokai and claims to have come from the planet Cheron that is situated in the southern uncharted region of the galaxy. Kirk informs him that he is to be returned to Starbase 4 and charged with the theft of the shuttlecraft. Lokai makes a great show of being greatly offended at the implication of theft but is not forthcoming when asked the reason for him taking it. Kirk is called back to the bridge because an invisible craft has been detected which appears to be on a collision course with the Enterprise. It explodes on impact with the starship's shields but an alien life form is beamed aboard safely before its destruction. Kirk and Spock go to the transporter room to meet the new arrival and are surprised to find that he is a similar being to Lokai, except that his colouring is exactly the opposite, white on his left side and black on his right. He introduces himself to Kirk as Commander Bele and announces that he has come to collect Lokai who is, allegedly, a convicted criminal from the planet Cheron. Bele demands that Lokai is handed over into his custody immediately and that the Enterprise takes them both back to the planet Cheron. Kirk refuses his demands, telling him that his 'request' will be passed on to Starfleet Command for consideration as no extradition treaties exist. Lokai accuses Bele of oppressing his people and demands that Kirk grant him asylum. Using his mental powers, Bele changes the ship's heading and points it towards Cheron but is forced to back down and return control of the Enterprise when Kirk threatens to activate the self-destruct sequence. 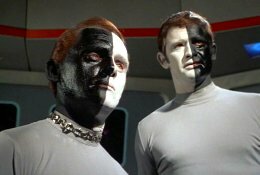 Bele tells Kirk that his planet is split by racial hatred between the two colour configurations. He claims that Lokai is responsible for terrorist acts committed against his people and has been pursuing him for fifty thousand years, but Lokai always seems to find people to believe his lies and help him to escape. He allows Kirk to complete the mission to Ariannus but then takes control of the ship again, this time disabling the self-destruct mechanism, once more heading it towards Cheron. Lokai appears on the bridge and the two beings attack each other. Locked together in physical combat, the pair become enshrouded by a red-hot force field as their powers clash. On reaching Cheron the Enterprise sensors indicate no sign of life and it is apparent that the entire population has destroyed itself through racial hatred. Lokai flees down to the planet's surface with Bele in hot pursuit. The Enterprise leaves them on the planet, the last two of their kind continuing the fight that has destroyed their species. After fifty thousand years hatred is all they seem to have left.